Tucson, AZ, April 10, 2019 --(PR.com)-- Beads of Courage, Inc., an international nonprofit organization supporting children with cancer and other serious illnesses, today announced receipt of a grant from the Scarcelli Family Foundation to support the siblings of children participating in the Beads of Courage Program. The mission of Beads of Courage is to provide innovative arts-in-medicine programs that improve the quality of life of children coping with serious illness. While the core Beads of Courage Program focuses on children currently undergoing medical treatment, the organization’s Sibling Program provides recognition and support for siblings when the serious illness of a brother or sister impacts their lives. The Scarcelli Family Foundation grant will provide the Beads of Courage Sibling Program at no cost to 5,000 children who are brothers and sisters of Beads of Courage members. The Sibling Program focuses on themes which help siblings cope, as well as talking points to encourage communication and healing opportunities. Each Sibling Kit includes a facilitator guide, participant guide, and 25 unique beads that honor the sibling. "We are incredibly grateful to the Scarcelli family for their support of the Beads of Courage Sibling Program," said Jean Gribbon, executive director of Beads of Courage. "Their generous grant will help thousands of courageous siblings as they walk beside a brother or sister who is coping with serious illness." The Scarcelli Family Foundation was created to honor the family’s legacy of giving back by supporting children and families in need. The family was introduced to the Beads of Courage Program when their daughter Rachel was born with a chronic cardiac condition. During her treatment journey, they observed the impact her health was having on their family as a whole, including on their sons James and Nicholas. "We recognize the value of the Beads of Courage Sibling program in acknowledging the courage of brothers and sisters who are impacted by a sibling's life-threatening illness," said Melissa Scarcelli, the children’s mother. "It is our hope that by using this program, siblings can find moments of healing and feelings of love." In honor of National Siblings Day and the Scarcelli Family Foundation grant, Beads of Courage will hold a Sibling Workshop at Lurie Children’s Hospital of Chicago on April 10 at 6:00 pm local time. Additional Sibling Workshops are planned at Beads of Courage member hospitals throughout the year. 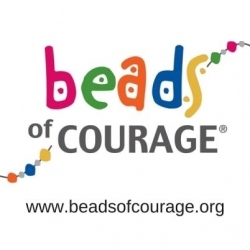 The flagship Beads of Courage Program is a resilience-based intervention designed to support and strengthen children and teens coping with cancer and other serious illnesses. Participants in the program record, tell, and own their stories using beads as meaningful symbols of courage that commemorate milestones along their unique treatment path. For more information on Beads of Courage, visit www.beadsofcourage.org. About Beads of Courage: The mission of Beads of Courage is to provide innovative arts-in-medicine programs for children coping with cancer and other serious illness, their families, and the clinicians who care for them. Beads of Courage programs are evidence-based interventions designed to strengthen resilience, alleviate suffering, and improve the psychosocial adjustment process. Beads of Courage is a 501(c)(3) tax-exempt organization. For more information or to donate, visit www.beadsofcourage.org.